Elegante Press designed these business cards for Kails, a company that produces healthy food products through food-drying/freezing method. The word ‘Kails’ means ‘Cheers!’ in Old Prussian language. 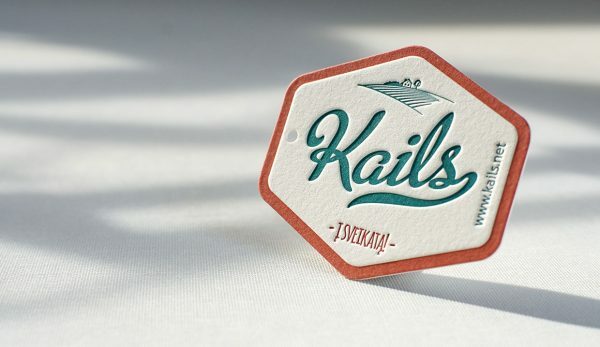 Elegante Press figured that ‘Kails’ is a good name choice for the brand, therefore a big logo and a farm image were letterpress printed on one side of the business card to emphasize that, while contact information on another. Both sides were printed separately on a 300gsm cotton paper sheets before been glued together, forming a 600gsm card stock. Then, by using the die-cut method, the business cards were made into a hexagon shape and completed with a drilled hole to be used as a hangtag. Informative and useful – now that’s a smart combination!